Global TraPs terminated formally at the end of 2013. 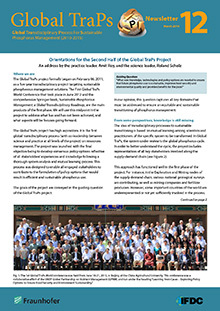 The Global TraPs Newsletter NL13 (March 2015) includes a brief summary and comments of the practice leader Amit Roy (IFDC) and of Roland Scholz (Fraunhofer IFDC). Newsletter NL 13 also includes a complete documentation of all four workshops and the Global TraPs World Conferences, seven Global TraPs case studies, eighteen chapters and spotlights included in the Global TraPs book (Springer), six peer reviewed scientific papers, two book chapters, three strategic papers, eight master theses as well as the booklets from the Mutual Learning Sessions oft he 2013 Beijing conference. 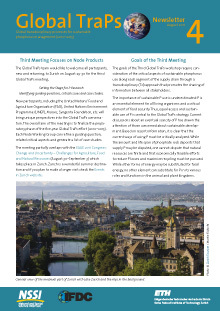 In order to properly utilize the achievements of Global TraPs, a proposal was launched for transitioning Global TraPs phosphorus initiative to UNEP Global Partnership for Nutrient Management. This proposal was positively dealt with at the third Steering Board Meeting of the GPNM, held on December 10 and 11, 2014 in Washington, DC. 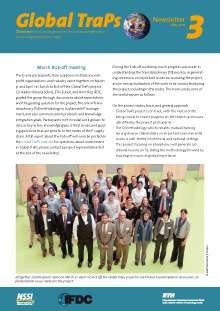 For more information see the final Global TraPs Newsletter NL 13 which includes a documentation of all publications and activities of the Global TraPs project. Arnoud Passenier (Dutch Ministry of Environment), Amit Roy (IFDC, USA), Rolnad Scholz (Fraunhofer IGB, Stuttgart) and some others will be members of the GPNM phosphorus task force. 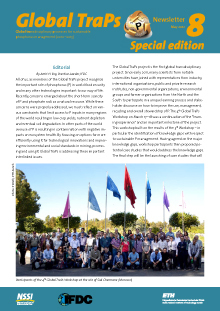 For more information see the final Global TraPs Newsletter NL 13 which includes a documentation of all publications and activities of the Global TraPs project. Further, the Global TraPs work is utilized in the current work oft he UNEP International Resources Panel, in particular in ist efforts to protect the marine environment. A special issue on Losses and Efficiencies in Phosphorus Management of the Elsevier Journal Resources, Conservation, and Recycling (editors R.W. Scholz and T. Hirth) will appear in November. 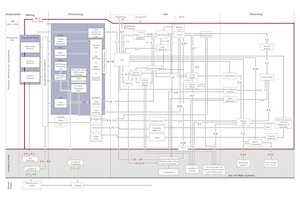 As special feature on the topic The Reality of Transdisciplinary Processes (editors R. W. Scholz and G. Steiner) will be published in the Springer journal Sustainability Science October 2015. This special feature will include some papers which report on and analyze the experience with transdisciplinary discourses gained in the Global TraPs project. This figure is taken from: Scholz, R.W., A.H. Roy, and D.T. 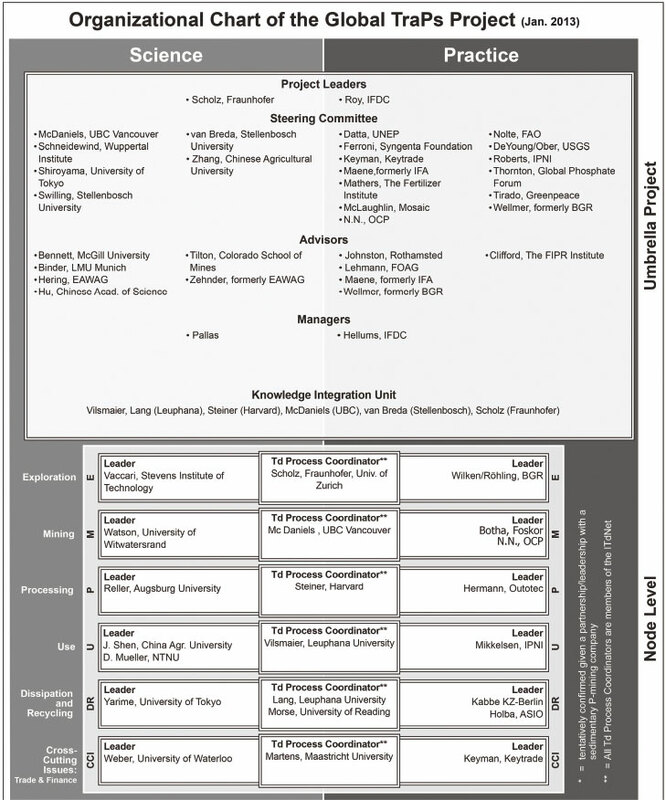 Hellums, Sustainable phosphorus management: A global transdisciplinary challenge, in Sustainable Phosphorus Management: a Global Transdisciplinary Roadmap, R.W. Scholz, et al., Editors. 2014, Springer: Berlin. p. 1-113. TraPs officially started on February 6, 2011. Originally planned as a five year project to address sustainable phosphorus management, through a transdisciplinary process, the project will conclude on December 31, 2014. Integral to Global TraPs, was participation of over 200 key stakeholders of the phosphorus supply-demand chain openly sharing their knowledge and experiences on prevailing concerns associated with current phosphorus management practices. While the first phase of the mutual learning process on sustainable phosphorous use went exceptionally well, unfortunately, additional funding to finance the final phase related to proposed policy recommendations to support sustainable phosphorus was not acquired. 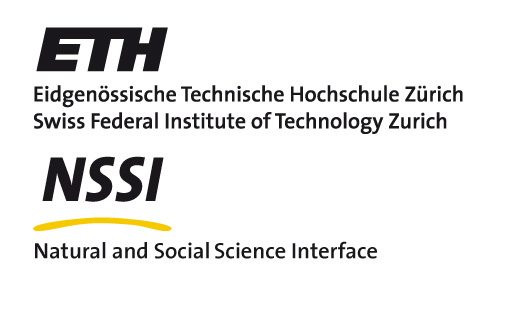 Thus, the leaders of the project, Dr. Roland Scholz (Senior Advisor, Fraunhofer IGB, formerly Professor ETH) and Dr. Amit Roy (President and CEO, IFDC) determined that the project will be terminated on December 31, 2014. Global TraPs proposed to the Steering Board of the Global Partnership for Nutrient Management (GPNM), the launching of a GPNM led Phosphorous Initiative (the exact name yet to be determined) (IPI), similar to the International Nitrogen Initiative (INI). If this action is approved, it will maintain the knowledge base gained in Global TraPs as well as the network of representatives from the private and public sectors. Under this proposal, Global TraPs’ knowledge could be transferred into a more permanent structure. The initial proposal was positively received by the Steering Board of GPNM in Bhubaneswar, India, this March. 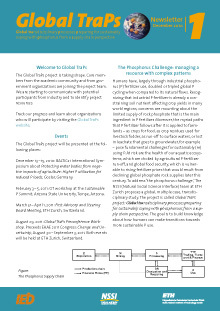 However, before reaching a final decision, the Board commissioned a group of practitioners and scientists to prepare a white paper to detail out the objectives, goals, and modus operandi of this new phosphorus initiative taking into account lessons learnt from the Global TraPs initiative. 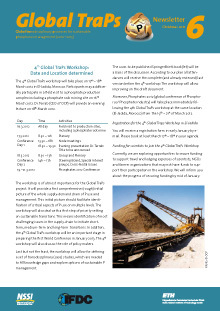 Global TraPs will close-out the various case studies which were launched after the 4th Global TraPs workshops. The project will provide the latest information via the Global TraPs Newsletter 13, which will appear later this year, and the results of these case studies will be published soon. First results from the SMAP-Kenya case study on Smallholder Access to Phosphorus will be published next year in a special feature of Sustainability Science with the title “The Reality of Transdisciplinarity.” Those who want to provide another paper to the special feature please contact Roland Scholz (roland.scholz@igb-extern.fraunhofer.de) and Gerald Steiner (gsteiner@wcfia.harvard.edu), both editors of the journal . You may find the Global TraPs Newsletter 12 below in the Newsletter section or click here. The summaries of the Mutual Learning Sessions and Dialogue of the 1st Global TraPs World conference are now available on the MLS & DS 2013/2014 page. The present response is based on feedback of Global TraPs’ leaders, steering board, and members. The Global TraPs project includes representatives from all key stakeholder groups of the key nodes of the supply-­‐demand chain, i.e. Exploration, Mining, Processing, Use, Dissipation and Recycling as well as Trade and Finance. 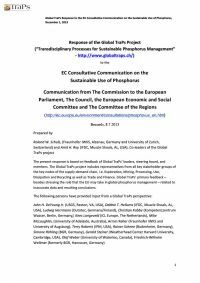 Global TraPs’ primary feedback – besides stressing the role that the EU may take in global phosphorus management – related to inaccurate data and resulting conclusions. 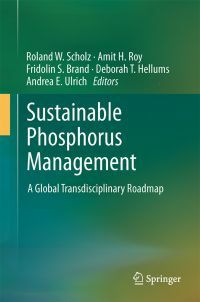 A main product of the first half of the Global TraPs project is a comprehensive book with the title Sustainable Phosphorus Management – A Global Transdsiciplinary Roadmap. There are 53 contributing authors, including 19 practitioners (mostly from private sector industry) and 24 scientists from public science institutions (mostly from universities). The book has been edited by Roland W. Scholz (Fraunhofer IWKS and ETH Zurich), Amit H. Roy and Deborah T. Hellums (IFDC), and Fridolin S. Brand and Andrea E. Ulrich (ETH Zurich). Global TraPs is grateful for the support of the institutions. Identifies case studies and proposes a research agenda for critical questions of sustainable phosphorus management. 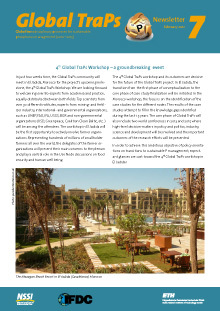 The first draft of the chapters focused on the nodes of the supply chain (exploration, mining, processing, use, dissipation & recycling) and the cross-cutting issues of trade and finance were discussed at the 4th Global TraPs Workshop in El Jadida, Morocco in May 2012. However, the review process and the elaboration of a comprehensive system analysis which is presented in chapter 1, as well as the supplementing spotlights which deal with topics which promoted vivid discussion (e.g. phosphorus losses or the health dimension of phosphorus), are now presented in 10 spotlights. Below, we present the list of contents and a description of the book. The book has entered the layout department in this October, but may be ordered now for your personal use or your library at Springer publisher or amazon. 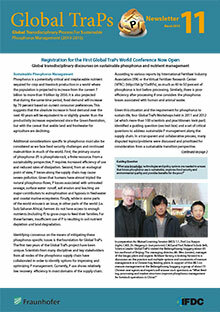 The Global TraPs 1st World Conference, which will be held in Beijing, People’s Republic of China June 18-20, 2013. 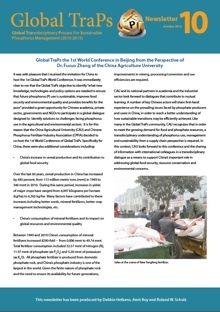 This conference was jointly organized was hosted by the China Agricultural University and the Chinese Ministry of Agriculture. 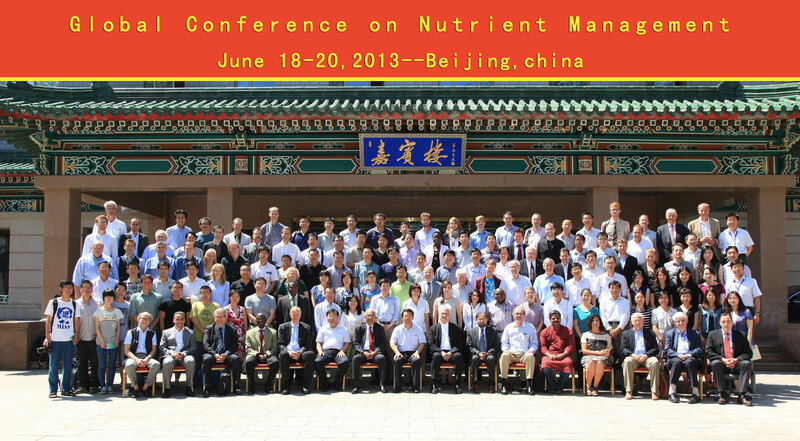 The conference was jointly held with the fifth conference on the Global Partnership for Nutrient Management (GPNM). Day one of the conference was shaped by Mutual Learning and Dialogue Sessions on Chinese cases (e.g. manure management in the peri-urban region, avoiding fertilizer overuse in vegetable gardening). Days two and three provided a comprehensive system analysis on the phosphorus and nitrogene cycle. More than 170 people, more than half from abroad, attended excellent presentations and valuable discussions. For developing policy options a set of case studies and discourses among the key stakeholder was launched. the increasing water contamination caused by excessive P use and/or poor management practices. Off-site P losses cause negative environmental impacts by triggering surface water runoff and soil erosion. Phosphorus has a tremendous positive impact on food and fiber production (essential component of food security and human health), but much can be done to improve this impact. Sustainability of P resources has become a serious, worldwide concern and therefore needs attention. A great deal of knowledge exists on ways to manage P without causing adverse effects to the environment. However, in many places, P management leaves a great deal to be desired. Given the central role of P in food security and human well-being, and the low use of P among some smallholder farmers, access to P by the resource –poor producers has to be improved.